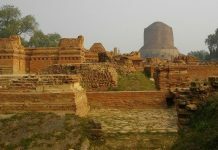 The Archaeological Survey of India during its excavations carried out at Chandyan village in Baghpat district of Uttar Pradesh, has found remnants of a house that correspond to the late Harappa period. 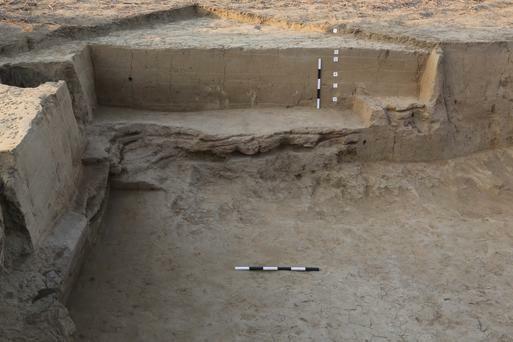 This is the first time when remnants of old civilization pertaining Harrappan period are found in the Upper Doab region which lies between Ganga and Yamuna rivers. The ASI started excavation in the area on 27 November and excavated five trenches in December, each of 10×10 metres, with two trenches in the habitation locality and three in the burial area. The excavation in the residential area revealed a mud wall and post-holes in one trench and four closely laid and successive floors of a house in another trench and pots. They were found at a depth of 130 cm and upwards from the surface level. The posts positioned in the holes would have supported the roof of the house. In the burial site, 150 metres from the residential area, excavations brought to light 21 pots, animal bones, remains of a feast, indicating a funeral ceremony. The orientation of the burial site was from northwest to southeast. The 21 pots might have contained cereals, milk, butter and honey used in the funeral ceremony. ASI believes that the house is remnant of multi level structure and it belongs to late Harrappan era of around 1900-1800 BC when the Indus Valley Civilization, popularly known as the Harappan Culture, began to decline. The Harappan link to the area was established in 2005 when a farmer accidentally discovered a huge burial site at Sinauli village located just 40km from Chandayan. The Sinauli graves are also believed to correspond to the late Harappan period. In August 2014, a human skull with a copper crown with carnelian beads corresponding to the late Harappa period was discovered at a brick kiln site in the Chandayan village. Beads of carnelian, a semi-precious stone, are generally associated with the Harappan civilization. 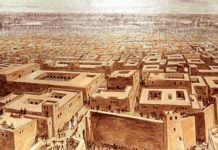 The Indus Valley Civilization, which is known for its superior urban planning, is believed to have flourished in the period between 3300 BC to 1300 BC in what is today Pakistan, northwest India and parts of Afghanistan and Balochistan.